Governor Steve Bullock addressed delegates at the state Democratic convention over the weekend. Governor Steve Bullock tells Democratic delegates to expect "big money" to be spent in the upcoming governor's race. Montana Democrats re-elected their party leadership and heard pep talks about the coming election at their party convention over the weekend in Bozeman. Compared to the Republican convention seven weeks earlier, when the sitting party chairman was voted out, the state Democratic get-together was a low-drama event. Incumbent party chair Jim Larson and vice-chair Jacquie Helt both won re-election, and then party leaders urged delegates to hit the streets and work hard if they expect to gain legislative seats in the 2016 election. U.S. Senator Jon Tester urged them not to take anything for granted. "It is about going out there and raising money," Tester said, "and talking to your neighbors, and talking to the folks you go to church with, and raising some more money. Hate to say it, but it’s a fact, it’s where it is. And we can get candidates elected to the legislature." 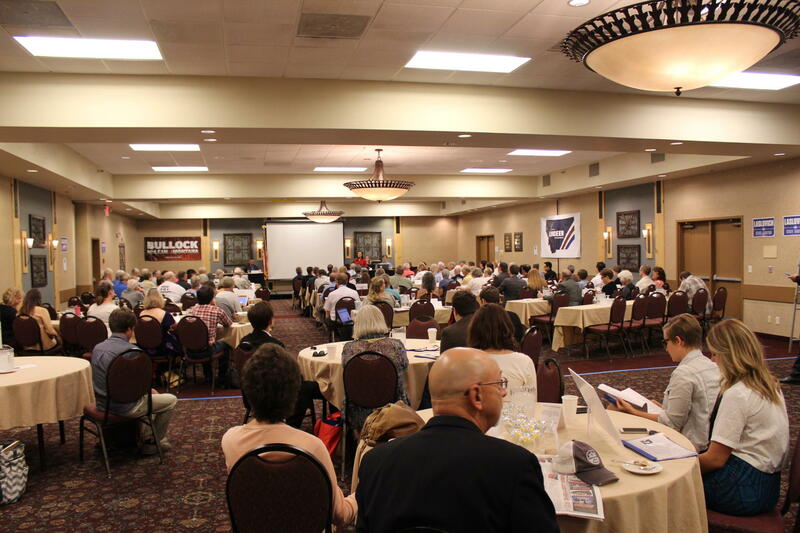 Hundreds of Democrats from around Montana attended the convention in Bozeman. Governor Steve Bullock, who has yet to announce his own bid for re-election, nevertheless urged Democrats to get ready for an expensive race against a GOP challenger. Republicans have been charging for months that Bullock is the real face of “big money” in Montana politics, because fundraising is a major part of his role as chairman of the Democratic Governors Association.They accuse him of raising dark money nationwide while condemning the same practice at home – a charge Bullock denies. As the Governor reminded Democrats, the general election is 450 days away, and everybody who wants to be a part of it has a lot of work to do. Brad Johnson is set to write another chapter in his political biography. The former Secretary of State cruised to victory in the District 5 race for the Public Services Commission. He will replace retiring Republican colleague Bill Gallagher. Not everybody's summer road trip around Montana generates headlines at every stop, but Greg Gianforte's does, and Gianforte is not just anybody. He's been meeting with local chambers of commerce, like a group of about 10 people at the Sport Club restaurant in Shelby recently.